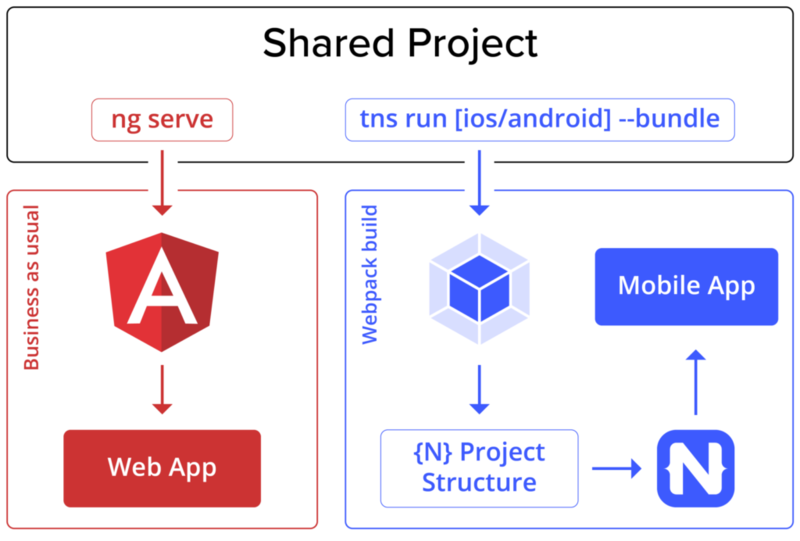 Here is an exciting new way to build web and mobile apps with Angular and NativeScript. First, some background: since the beginning of Angular, you could use NativeScript with Angular to build mobile apps. However, when you needed to build both a web and a native mobile app, you had to create, develop and maintain two separate projects. Although this got the job done, it quickly became apparent that we could do better than that. This challenge led to a dream of a Code-Sharing Project. One that would allow you to keep the code for the web and mobile apps in one place. One that would allow us to share the business logic between web, iOS and Android, but still be flexible enough to include platform-specific code where necessary. With the dawn of Schematics and ng add we now had a whole new set of possibilities. convert an existing web project to a code-sharing structure. generate new components and modules in a code-sharing format. The objective is to share as much code as possible, and break the platform-specific code into separate files. Here’s a diagram to show you what that looks like at a high level. To get started you could either create a new project with a code-sharing structure. Just run ng new with @nativescript/schematics as the collection. To complete the story, we need a build process that is capable of using the shared files and the platform-specific ones, and provide a web or mobile app as a result. To build a web app, it is “Business as usual”, just use the Angular CLI to do the job. When you call ng serve or ng build, the Angular CLI ignores all NativeScript-specific files — as none of the web files would directly reference any .tns files. In order to build an iOS or an Android app with NativeScript, we need to use the NativeScript CLI with the NativeScript Webpack plugin. During the build process, Webpack takes care of providing the .tns files whenever they are available, and as a result hiding the web versions of the same files (virtually, files like home.component.tns.html become home.component.html). While the NativeScript CLI is responsible for building a native mobile app. For more Information and to build website using Angular, Hire Angular Developer from us as we give you high quality product by utilizing all the latest tools and advanced technology. E-mail us any clock at – hello@hkinfosoft.com or Skype us: “hkinfosoft“. To develop custom web app using Angular, please visit our technology page.